StarHub, in collaboration with Asurion, the global leader in technology protection services, today introduced Singapore’s first mobile phone after-sales support plan for its mobile post-paid customers. With SmartSupport, customers can easily seek remote technical support for their phone or replace a defective or misplaced phone in as soon as four hours. In addition, they can use the SmartSupport mobile app to back up phone data in the cloud as well as enjoy a suite of mobile security and privacy utilities. Customers who have technical issues with their phone can call the SmartSupport helpdesk experts who will provide remote troubleshooting or offer essential tips on getting started with a new phone, such as importing mobile contacts and discovering new features. The SmartSupport hotline is open from 8 am to 12 midnight daily and will operate around-the-clock by the end of the year. If a SmartSupport user needs to swap or replace the enrolled phone, he or she can initiate a service request by calling the SmartSupport hotline. For successfully processed service requests before 2pm from Monday to Saturday, the customer will receive the replacement phone in as soon as four hours within Singapore. The service is also available if the customer loses the phone overseas. StarHub also recognizes that mobile users are even more concerned about the personal information stored in their phone. Using the SmartSupport app and web portal at www.starhub.com/smartsupport, customers can enjoy a data backup service that stores contacts, photos and videos in the cloud as well as conveniently retrieves backed-up content and transfers them to the replacement mobile phone. Other features include locating the misplaced phone, remotely wiping the data and scanning the phone for malware and malicious apps. 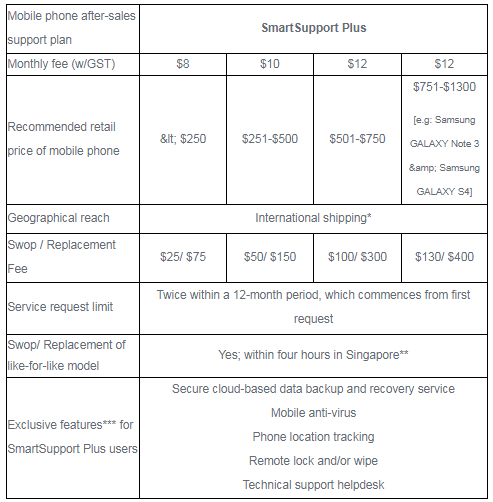 Beginning September 27, customers who sign up for or renew their StarHub Mobile post-paid plan with a new Samsung GALAXY Note 3 or Samsung GALAXY S4, can subscribe to SmartSupport. The service will be available for any new mobile phone purchase from StarHub by November.